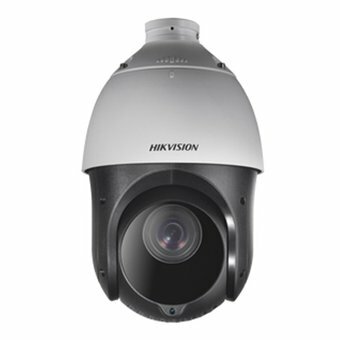 The Hikvision DS-2DE4215IW-DE is an advanced PTZ dome camera with Full HD resolution. This model has an IR night vision of 100 meters, can rotate 360 ? ?° horizontally and has 15x optical zoom. The Hikvision DS-2DE42125IW-DE is an advanced Full HD security camera with a wide range. This outdoor camera can rotate 360 ? ?°, tilt 90 ° and has 15x optical zoom. This means that you can move the camera lens in any direction and that you can zoom in far without loss of quality. The Hikvision DS-2DE42125IW-DE is therefore very suitable for monitoring a large area, for example at airports, squares, stadiums and roads. With a surveillance camera it is important that the image material is of high quality under all circumstances, day and night. You can be assured of this with the Hikvision DS-2DE42125IW-DE. In the dark, the infrared function switches on for a night vision of no less than 100 meters. This reduces noise to a minimum thanks to the 3D Noise Reduction technology. And if the lighting conditions are not optimal during the day, the camera applies WDR (Wide Dynamic Range). This is a technique where under and overexposed parts of the image are automatically corrected so that you always have an excellent image. This security camera from Hikvision is powered via Power over Ethernet (PoE +) or a 12VAC power adapter. If you want to save the camera images locally, you can insert a microSD card up to 256GB (not included). It is also possible to connect the camera to a NAS recorder or NVR. This way you can always consult the video images if necessary.